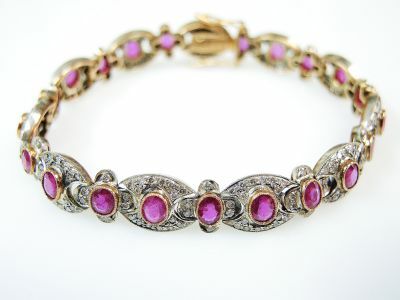 An incredibly beautiful Edwardian inspired 18kt yellow gold with silver top mill grain bracelet featuring 22 oval facetted cut deep pinkish red rubies, est. 8.65ct and 242 round brilliant cut diamonds, est. 2.36ct (clarity:VS-SI1 & K-L-M colour). It is approx. 7 1/4 inches (19.14cm) in length.